As my girls and I were delivering newspapers this afternoon I was thinking about what I am thankful for today. Here is what came to mind…. Cuddling with my son after he sneaks into our room before it’s time to start the day. He keeps me so warm! When he isn’t wiggly I like to wrap my arms around him, pray over him and thank the Lord that he blessed me with a son. Our paper route…. no, it isn’t my favorite job but the Lord continually shows me what a blessing it can be. We have had the paper route for 4.5 years; ever since Jonathan was about 9 months old. Our 4 oldest all help and are paid based on the amount of bundles they fold. So, the blessing is being able to help contribute financially to the family and doing it with my kids. They are learning: work get paid, don’t work don’t get paid! The Scriptures! I am so blessed to be able to get in the Word everyday and read the Scriptures with my children. There is so much life, hope and faithful instruction in God’s Word. Oh I just thought of another one…I get to go to a women’s conference tomorrow (Fri) evening through Saturday evening. I don’t typically like going to women’s conference but I’ve heard this one is different then the kind that I’ve been to in the past. I know several other women that will be attending and am looking forward to a night away. 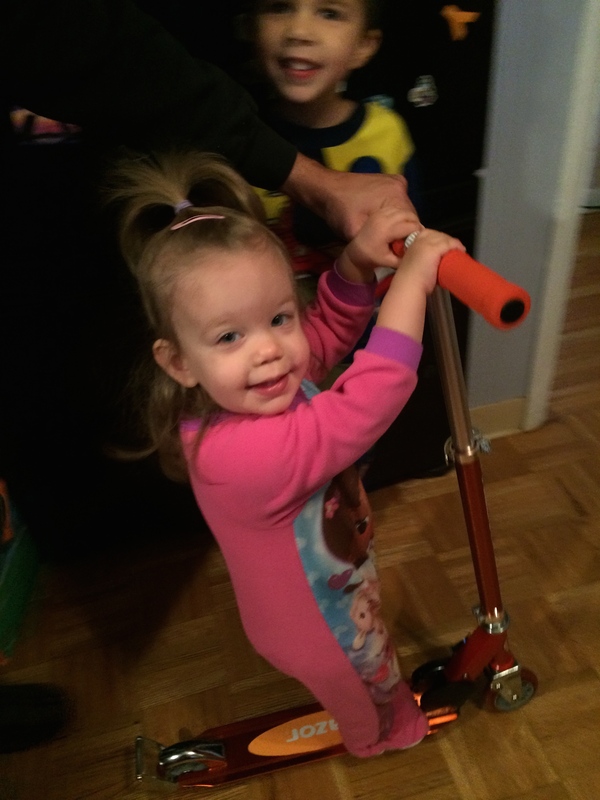 Katherine riding the scooter that J got for Christmas. 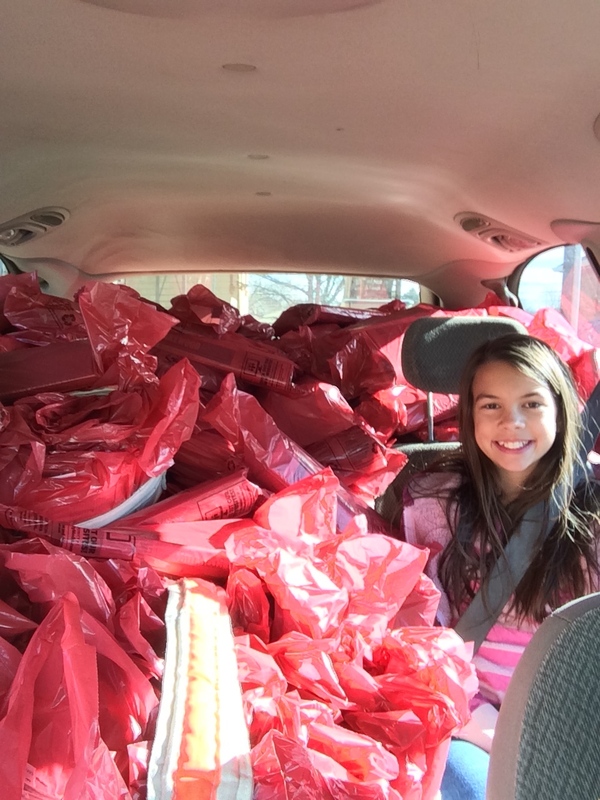 The van is loaded and we are ready to deliver the newspapers! I searched my bible for verses that included the word thanksgiving. There were so many I couldn’t count them all…. at least not tonight as I need to get to bed so I can get some sleep and take care of my family tomorrow! Psalm 95:2 Let us come before His presence with thanksgiving, Let us shout joyfully to Him with psalms. What am I thankful for this first week in 2016? In no particular order…..
First, I was blessed to visit with a family that has a special needs daughter. Sweet Melody is about to turn 3 years old. The doctors told her parents she would not make it 6 months of age. She is thriving and doing so well. Yes, she is terminally ill but she has defied the odds in our throw away society. Her mom shared with me that since Melody has been born her own ministry has moved from a parenting focus to encouraging and building up other mothers with special needs children. She shared a few stories with me and it made me realize how thankful I am for my children. We are blessed to have 5 healthy, sweet and beautiful children. Thank you Lord! Psalms 100:4 Enter His gates with thanksgiving and His courts with praise. Give thanks to Him, bless His name. Second, the Lord has blessed me with the most amazing man as my husband. He loves me when I’m unlovable. He makes me laugh just when I need something to laugh about. He gives me a safe place to cry when I need to. He is the most amazing man to our 5 wonderful children. He works very hard to take care of our family. He cares for others more than he cares for himself. He looks for opportunity to reach the lost and build relationship with those don’t believe as he does. Most of all he loves the Lord with all his heart. Third, I’m thankful for my mom. She does so much for us and we are so grateful for all her efforts. It is a blessing to have her live with us and be such an important part of our lives. I look forward to what the Lord and the new year has in store for us. I pray your 2016 is a blessing to you and those you love.